President-elect Donald Trump is pulling back from some of the immigration policies he proposed as a candidate. Trump is still promising stronger enforcement of immigration laws. He also continues to call for a new wall along the United States southern border with Mexico. But he no longer calls for the removal of 11 million undocumented immigrants in the United States. His campaign proposal to block all Muslim immigrants was modified before the November 8 presidential election. 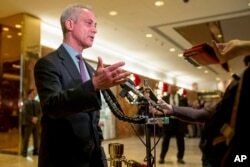 The new proposal calls for more careful “vetting” of people seeking to enter the United States. Trump says he will cancel some of President Barack Obama’s executive orders, but he is suggesting a willingness to compromise. Trump softened his position in a recent discussion with Time magazine. Trump also said that he will not try, as he once said during his campaign, to remove all illegal immigrants. Instead, Trump said he will order the removal of undocumented immigrants who have committed crimes. But that will not be easy. The Obama administration faced opposition from some countries that refused to accept the return of their citizens. Trump said he is keeping his campaign proposal to build a big wall along the United States southern border. He spoke about the wall during a recent speech in Wisconsin. During the campaign, he said Mexico would pay for the wall although Mexican officials have said they have no plans to do so. Trump has said he also plans to move ahead with his proposal to cut federal funding for cities that refuse to hold undocumented immigrants. He has pointed to serious crimes, including murder, committed by some undocumented immigrants who were released after serving sentences for earlier crimes. The U.S. Immigration and Customs Enforcement (ICE) sometimes requests to be told when a non-citizen is released from a state or local prison. This would permit the agency to take that person into custody and decide if the person should be deported. But some local and state governments do not do this for several different reasons. One reason they give is that immigration enforcement is not their responsibility. Another reason given is that if they help to deport people it might lead to distrust between immigrant communities and local police agencies. Rahm Emanuel is the mayor of the American city of Chicago. He is one of a number of mayors who say his city will continue its sanctuary city policy, even if results in loss of federal funds. Chicago Mayor Rahm Emanuel after meeting with Donald Trump. But Trump does not appear likely to soften his position on this issue. He nominated Alabama Senator Jeff Sessions for attorney general, the federal government’s top law enforcement position. Sessions proposed a bill as a senator to cut federal funding to cities that do not hold and turn over undocumented immigrants to federal immigration officers. Roy Beck heads Numbers USA, a Virginia-based group that supports more limits on immigration. He said Trump’s promise to limit immigration was a major reason he won the presidential election. Beck expects Trump to focus on cutting temporary permits for foreign workers and other programs that might take away jobs from American citizens. Bill de Blasio is mayor of New York City, America’s most populated city. He supported Hillary Clinton for president, but recently met with Trump. He urged Trump not to cancel President Obama’s executive order that allows people who came to the United States as children to remain in the U.S. and get work permits. 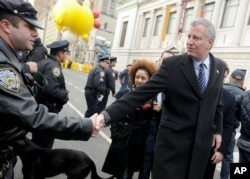 New York City Bill de Blasio, right, at New York's Thanksgiving Day Parade. vetting - n. to investigate thoroughly to see if they should be approved -- in this case for entry to the U.S.